The year is 1599. It's the year that may have been William Shakespeare's greatest year of writing. In that year, he wrote Henry V, Julius Caesar, As You Like It, and Hamlet. No small feat! But was their anything that lead to this? Did the outside world play a factor on Shakespeare, his writing process, and his inspiration? And are there any dramatic through lines in this quartet of plays? In the extraordinarily impressive 1599 Project, Irondale Ensemble gives you four condensed Shakespeare plays in four and a half hours. The only problem is, what happens when the concept and the execution don’t really add up? Billed as an evening that explores the year that Shakespeare wrote four of his epic accomplishments, 1599 transports the audience into each play, whether they are entirely familiar or not. The pitch that director Jim Niesen conceived is that together, the four plays form a narrative about one mythic hero from youthful idealist to madman. The concept is spellbinding. Could these four drastically different yet eerily similar narratives relate to one another? First and foremost, what was presented was no small feat. It was an endeavor of grandeur. But the presentation and the synopsis don’t necessarily go hand in hand as a little more care and attention was needed. And it all comes down to this. If the thesis is that one mythic hero lives in Henry V, Julius Caesar, As You Like It, and Hamlet, in order for the audience to track this journey and explored properly, one actor needed to portray all four of individuals in each piece. Granted, it’s nice to share the wealth of material amongst the company, and it’s clear that’s what happened, but when you set out to achieve a theory, the execution needs to support it. And one singular actor needed to play Henry, Brutus, Rosalind, and Hamlet. Similarly, the advisories in each needed to be played by one singular actor. The romantic interested needed to be played by one singular actor. And it goes on and on. Instead, what’s presented is a four-play cycle of plays about betrayal and revenge. It’s an intimate exploration of the texts that, the more you know, the better you can capture the cuts and trims. But it does not mirror the objective. Not knowing the objective you’ll certainly have a great appreciation for the project. This is an ensemble well versed in Shakespearean tongue that bares their heart and soul for the Bard. In the world of consistency, it lacked greatly in the overall conceptual costume design. Rather than keep the company in suits or modern, casual dress, they floundered from piece to piece, continuing the muddy the conceit. Putting all that aside for a moment, Niesen and his company should be applauded for the achievement. Doing one Shakespeare is hard. Four? That sounds like acting torture. The truncated experiences of each represent the works well, though some liberties are taken. Well, many for Hamlet. 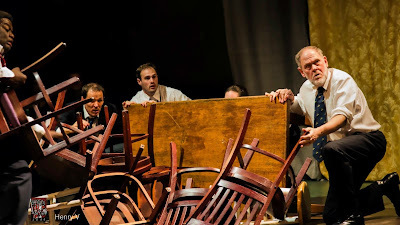 In Henry V, Niesen keeps the piece mostly contained within a box on the stage floor. It’s swiftly told in a manner that keeps the stakes eminent and the danger present. As the audience moved up to the top tier of Irondale, Julius Caesar came to life through a strange seating configuration. No matter where you sat, your neck was reeling from straining. The story of betrayal and the infamous Ides of March didn’t quite have the peril of consequence it desired. After a brief picnic, the audience was moved back downstairs for a jovial rendition of As You Like It. The story of love and deceit was a perfect post-meal treat that kept the audience engaged and excited, though some of the doubling was troublesome. And then we came to Hamlet. Quite possibly the most intimate of all the plays, this was not one to fool around with as the audience is likely going to be most familiar with the plot. And yet, this Hamlet was plunged into extended madness. Gender bending was present in the other three plays of the evening and yet we said good bye to Polonius in favor of Polonia, the mom. New takes on the text were taken. Modern references were integrated. And suddenly, Hamlet didn’t seem to match the rest of the evening, causing it to drag on. It’s certainly not due to fatigue. It felt too dissimilar that it caused frustration. The cast of six brought variety to the stage, but their camaraderie was apparent. No matter the play, Katie Wieland was the stand out. She brought arrogance as Caesar, innocence to Katharine, and grace to Gertrude. But it was her Rosalind that was the role to remember. Wieland captivated the audience and Orlando alike. Wieland’s effervescent approach had a hint of subtlety that was engaging. She certainly left you wanting more. As the other lady in the company, Alex Spieth’s strongest showing was that of Henry V. Her vocal inflection took some time but her luster in the infamous monologue set the tone for the night. Spieth and Wieland had great chemistry, mostly showcased in As You Like It. Next up in the leading character role, Michael-David Gordon’s Brutus was a bit lackluster, seeming to lack intentions. Though it could be in part due to the staging. Gordon made up for his Brutus as the hilarious Touchstone. His physical comedy was remarkable. Even if the luggage got caught on the fabric drop, Gordon didn’t lose a beat. Rounding out the big four leads, Joey Collins’s Hamlet was something unlike anything you’ve ever seen before. Collin’s Hamlet was drenched in extreme lunacy. It started off so extreme that it never really went anywhere, causing Hamlet’s decent into madness to be completely off. That being said, with the concept of the four plays forming one, this may have been a directorial decision. It’s a shame that Collins would be remembered for his portrayal as Hamlet as his roles in As You Like It were sublime. In a world where each play created one arc, Terry Greiss seemed to capitalize on this best, simply due to his casting. Playing many of the older characters, Greiss played with consistency. It wasn’t really until Orland that Sam Metzger got to shine. His bright-eyed lover was charming. Creating four distinct playing spaces in the giant room, Ken Rothchild’s use of rustic scenic elements, fabrics drapes, and throws to give each world a personality. Lighting designer Shannon White’s ability to bring evocative feeling to each piece was inspiring. With so many potential hurdles, White never once faltered or experienced a hiccup. As a complete night of four individual performances of Shakespeare, 1599 was something you’ll likely never see again. And in that regard, it’s something to shout from the rooftops. But it tried to be something that was not presented.